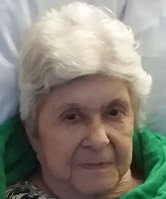 Betty I. Ginter, 79, of West Newton, formerly of Yukon, passed away peacefully Sunday, April 7, 2019, in Westmoreland Hospital. She was born April 3, 1940, in Indiana, Pa., daughter of John and Irene Sinnamond. Betty was preceded in death by her husband, Nicholas Ginter; and grandson, Christopher Ginter. She is survived by her sons, Nicholas J. (Rose) Ginter and Michael T. (Lisa M.) Ginter, all of Yukon; granddaughters, Dana (husband, Spencer), Ellie and Quin; grandson, Nicholas Ginter Jr.; and two great-grandchildren. She loved her family and was called "Nunn" by her grandchildren She enjoyed life at Filbern Manor and riding the community bus to go shopping whenever she could. There will be no services. She is at peace in God's kingdom. We love you, "Ma."